That Software Guy is a microconsultancy focused on web development and software design. Lately I have been developing software for Zen Cart, an open source shopping cart application for SMBs. My contributions to the Zen Cart project have been downloaded over 150,000 times. Agile product ownership, backlog grooming and requirements management for the Cosmos researcher sample and rule management system, a Ruby on Rails app running on Amazon Web Services. Cosmos tracked the detection status of malicious files the company was building detections for, and managed the publishing process for these detections. I managed the semi-monthly continuous deployments we did and kept stakeholders appraised of our status and roadmap. Running a variety of projects for Nielsen's Consumer Information Platform, a $3B business measuring what consumers buy. Responsible for ThreatAnalyzer, the flagship product of ThreatTrack Security. ThreatAnalyzer is a Ruby on Rails system which analyzes files and URLs to determine whether or not they are malicious. Supervised development effort, worked with QA, Marketing, Product Management, Tech Writing and Sales towards a successful product launch. Responsible for Anti-Virus Lab data flow, ensuring malware samples were consumed and processed, yielding up to the moment detections for known bad files. Staff management for groups of 6-8 engineeers. Windows .NET SDK for forms processing - ICR, OCR, OMR, filled form identification and form template creation. iOS and Android SDKs for barcode recognition, with Demonstration Apps in Google Play and the App Store. Shipped multiple software releases, managing staff assignments, problem reports and customer trouble tickets, help file and marketing updates, and working closely with QA to ensure sufficient test coverage. Responsible for the Media Monitoring System Remote Sites, a network of several thousand computers distributed around the United States which gather reference data for Nielsen. Matrix management of staff and peer groups (local, remote and offshore), proposal and analysis authoring, change and problem management, release oversight and delivery, vendor negotiation and relationship management. Reduced the number of active branches under simultaneous development from over 15 down to three; managed four major releases from development through to nationwide installation, with a dozen minor releases to deal with specific problems and feature requests. Designing a range of products to automate the process of television audience measurement across the United States and Internationally. Developed systems ranged from embedded solutions running in low-cost Linux PCs to custom hardware designed for MPEG encoding. Designing embedded software for Paradyne's DSL product line. Wrote the software in C for the Power PC running on VxWorks. Areas of responsibility ranged from driver level software to configure ATM switches to middleware managing statistics to a TL1-based user interface. Developed on Sparcstations in UNIX using the GNU toolset. Also worked on the design and implementation of the FrameSaver product line, a Frame Relay endpoint offering from Paradyne. Leading the newly assembled inter-team broadband BSC/OMC-R integration effort to correct deficiencies from third party contractors. Using C and embedded SQL with Informix on a Sun Sparcstation Platform to develop a GUI-based element management system. Developing client-server software for communication between components of the system. Member of Nortel's Broadband Networks team that contributed $3.4B, or 22% of total revenues, for 1997. Participated in ground-up development project to add Asynchronous Transfer Mode support to the Passport product line. Designed and coded embedded real-time software running under VxWorks RTOS using PMC-Sierra chipsets to provide layer 1 functionality and drive the DS3/E3 devices. Made heavy use of object-oriented design with C++; followed ISO 9001 process for development. Worked on off-switch applications in Network Management and OAM. Development prime and product manager for the Problem and Change Management System for Bell Northern's Information Systems group. Maintained and enhanced the user interface, which was written in IBM 370 Assembler. Wrote a new client in C for use on Unix workstations. Tutored Undergraduate classes and worked with the Department of Computer Services as a User Assistant, helping faculty and students make effective use of the computing resources. Took a year off school to go to China, teaching English to a group of graduate students preparing to study in the United States. The Better Together Discounting module for Zen Cart. I am the author. This software has been downloaded over 19,000 times by users of the Zen Cart open source shopping cart package. Zen Cart is an open source eCommerce framework written in PHP. I wrote several WordPress plugins to allow shopowners to easily show products from their ecommerce stores on their WordPress blogs. Discount Chooser for OpenCart allows storeowners to create "Buy , get at a discount" style offers with a configurable number and type of conditions and discounts. It is based on the original "Free Gift Chooser" plugin I did for Zen Cart. Better Together is a discounting module (Buy one, get one at a discount) I created for Zen Cart. It had its own in-code configuration method, but this was unsatisfactory to store owners, who were generally not computer programmers. So I created an AJAX based Admin Panel using XAJAX. Discount Preview is a mod which allows you to display order total discounts on the shopping cart page. In this way, discounts which are normally not visible until the second page of checkout are visible earlier. Author. Discount Preview was how I monetized the open source contributions Better Together and Quantity Discounts. These two contributions have over 40,000 total downloads. Allows cross selling at a discount; a product can be linked with another specific product, another product from a specific category, or any other product, with an associated discount (in dollars or % off) if both are purchased together. The associations must be hard coded, but once they are, generic logic can be added to the product_info page to display any available better together discount. Author. Additional information is available at the Better Together home page. In C, what is the difference between `&function` and `function` when passed as arguments? Which one is better : filter using SQL or PHP? Databases are optimized for doing this sort of thing. Don't do it in code. The malware ecosystem has changed drastically in the past 10 years, to the point that the old precautions of just using an anti-virus is no longer enough. Phishing attacks are a common occurrence in our modern era of connectivity. How to protect yourself. 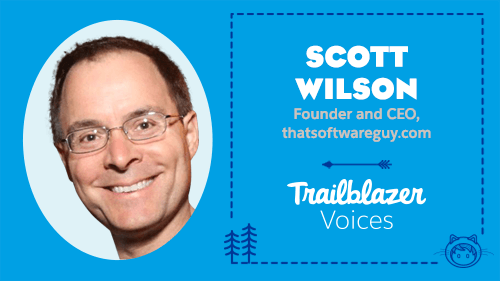 Meet Trailblazer and entrepreneur, Scott Wilson, who relies on Trailhead and Salesforce CRM to run his SMB. Scott advises other SMBs to take pleasure in doing all the little things that ensure a business thrives: operations, business development, and sales are just several things that ensure a business grows and prospers. Think of it as an investment in the future, and know that Salesforce SMB can help you obtain it. First computer A Kaypro running CP/M. I'm a member of Mensa and a certified Project Management Professional. I stay in shape by running and weight training. I have a large collection of vintage coffee cups. Written 439 answers. Active in opencart, php, android-ndk, linux, mysql and 8 other tags. First Computer: A Kaypro running CP/M.